At this point the reader is introduced to the depth of Westley’s pure and unconditional love for buttercup which is his prime motivator throughout the novel. He strengthens his mind and his body just for her and even gives up his life trying to rescue her. Westley’s love for Buttercup is his sole purpose and is even the reason for his survival from Dread Pirate Roberts. 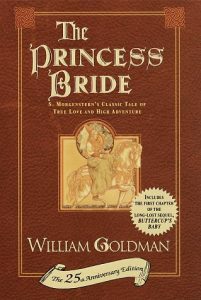 Goldman presents an unwavering love that is only possible in fairytales. It seems that the more Buttercup ages the more she develops emotionally and intellectually. Humperdinck no longer fools her and now and she analyzes his character for the reader, she characterizes him as a coward who hides behind his hunting to showcase his bravery and to mask his cowardice. One of the most enticing things about the novel is the freedom the author gives to his readers. Goldman says his father ends the story in “ they lives happily ever after”, S. Morgenstern’s version ends in the demise of the four characters, and he himself believes they survive but live on to lead a not so perfect life. No matter what the three versions state, Goldman asserts that the story is for the readers to decide and reimagine for themselves.